Parmesan cheese needs to age. 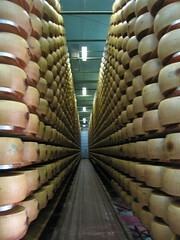 At the Hombre farm near Modena (run by the Panini family, of sticker album fame), a warehouse is full of wheels of organic Parmesan. You're in Italy? You missed some glorious weather by just two days! I was... Back in London now. I was visiting Maserati Racing to learn about the CAD/CAM system they're using - and got taken to lunch at the Hombre farm (where the Panini family also have a museum of Maserati cars!). So how many did you bend? Is that two cheeses per cow per day, or per farm per day? Per farm per day. They're big cheeses.